You will be given a reference e-book to read which has 378 pages And the test will be based on that e-book , you can take final test within 1 year of purchase. Google apps refer to a set of online applications offered by Google which usually include calendar, mail, spreadsheet, presentations and word processing. To the majority of the users, Google apps refer to the newest online computing environment which comes with applications that are extremely useful in both the home and the office. The process of operating the apps is actually different from the majority of the systems used by Google users in the past. The good thing about most of these applications is that they are free to use. A lot of experts also define Google apps as an online set of collaboration and communication tools. The tools make sure that all your data, files and applications are accessible online or in the cloud. This reduces the tendency of being stuck to using one type of application, computer system and location. Through the Google apps, you will be able to access all your data and files in any device as long as an internet connection is available. Google apps are also said to effectively function in facilitating the process of provisioning the applications offered by Google and the management tools that can be used by an enterprise or an individual such as Google Talk, Gmail, Google Docs, Google Calendar, Google Cloud Connect and Google Videos. The apps also feature more than 99% administrative support, up-time availability and any other corporate support. Completely understanding different applications offered by Google and how you can use each of them is now possible with the help of the Google apps certification course offered by Brainmeasures. You can expect Brainmeasures to offer you the most comprehensive Google apps course by explaining in detail the different Google applications that you can use in various industries and by offering the most accurate and detailed learning materials. This online certification and skill testing company is capable of offering you the most reliable training designed to help you fully understand each application in Google. Through this online certification course, you will know that the Google applications are extremely useful not only in the business industry but also in the educational sector, nonprofit institutions and government industry. To complete the program, Brainmeasures will require you to get a passing percentage on its Google apps test so they can supply you with your certificate. 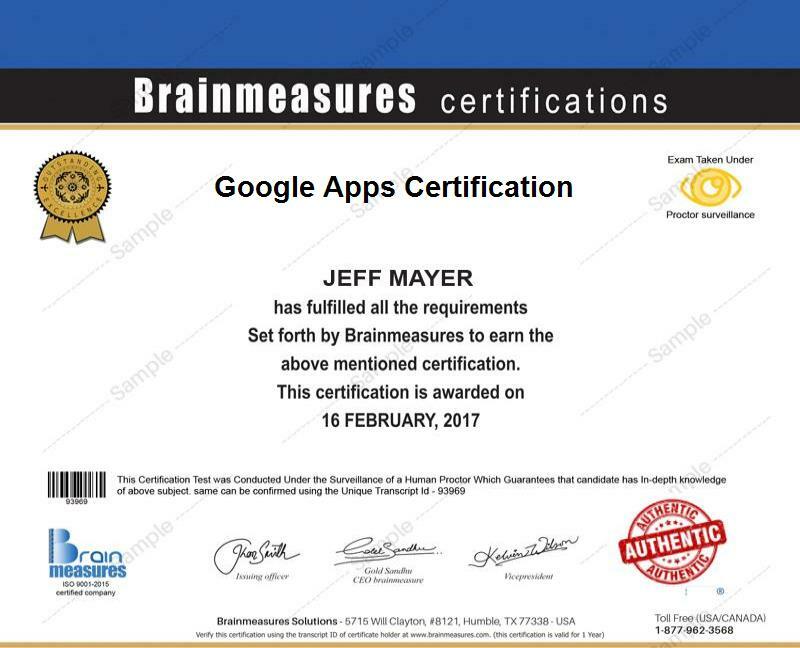 The Google apps certification program which you can access at Brainmeasures is extremely useful for all types of individuals as long as they have the interest in using various applications in Google. It is suitable enough for those who wish to learn the basics of using various Google applications including Spreadsheets, Calendar, Gmail, Presentations and Docs for personal purposes. The certification course is also suitable for professionals especially those who are working in the IT department and for business owners who wish to gain a complete understanding about how they can correctly use Google apps to improve the productivity in their workplace. If you are a Google apps certification holder, then you can expect your salary to be either on an hourly or fixed / full-time basis. Hourly rates will actually be dependent on the nature and length of your contract and the scope of your position but the rates will usually start from $24 per hour. If you decide to work on a fixed or full-time basis, then you can expect to receive an average annual salary of $83,000.